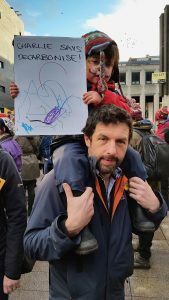 Me and youngest son, Charlie, on a rare climate march. “You mean…” ventured the middle one. I know it’s a complete Dad thing to moan on about “the house being lit up like a Christmas tree”, but I’ve been trying to instil in my three that being aware of climate change is one thing, but nothing will change unless we change. I’m fed up with everybody blaming the Government or a cabal of oil barons or neoliberalism (whatever that is), all of us can change what we do, what we buy, how and where we travel, and how we vote. Don’t feel that one person changing is insignificant – you are helping create the socio-economic demand which drives real change. And your behaviour influences others’ behaviour too – we’re herd animals and tend to conform to social norms. Create the new normal. Act.